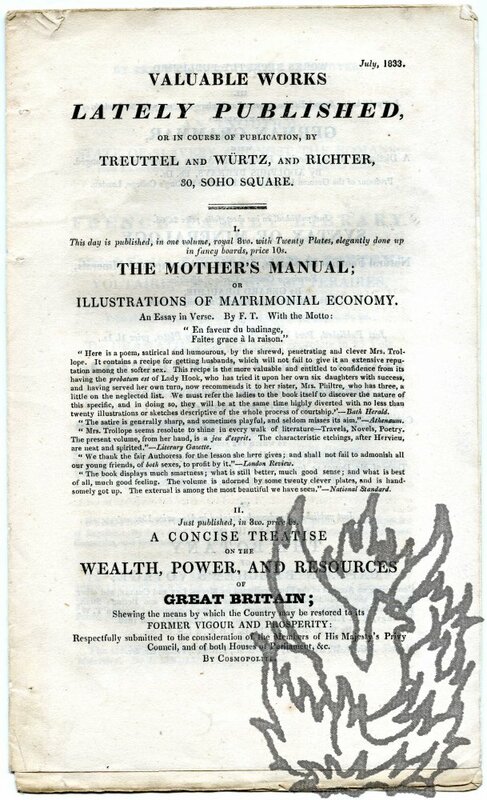 Valuable Works Lately Published, or in course of publication, by Treuttel and Würtz, and Richter, 30, Soho Square. 12mo, 16 pp. Unpaginated. Unbound and unstitched. Stabbed as issued. Fair, on lightly aged and worn paper. 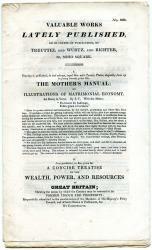 Extensive descriptions of 62 items, from 'The Mother's Manual; or Illustrations of Matrimonial Economy' to 'History of Russia, and of Peter the Great. By General Count Philip de Segur'. Five items 'In the Press' on the last page. Scarce: no copy in the British Library or on COPAC.